There’s a correlation between real estate data and the menu at a ritzy restaurant if you pay close attention to what is being said. Let’s say one day you sit at a fine dining establishment, poring over a very complex menu, not sure what to order. Should you ask the waiter for a recommendation? Naturally, you think, they will suggest the most expensive item in the joint and will probably never tell you if a particular dish is tasty or not, especially the priciest plates. However, every so often you come across a waiter who is willing to tell it like it is. You might ask about a particular dish and they will tell you, maybe it’s not a good idea. They might note, that personally, they really don’t like that item. A gutsy move. Certainly, one that the guy wearing the chef’s hat in the back and holding a meat cleaver would not want to hear. Something special happens at that exact moment. The customer begins to trust the waiter. The waiter is not just giving the “all’s great” sales pitch. He is being honest and giving the consumer the negative as well. So you order something else. And then perhaps you order the expensive wine he recommends. And the desert he brings by later. This is a technique that many people in the restaurant use today. Who would think honesty would be a technique? But it this day and age of the constant hustle, a bit of honesty goes a long way. Think about how a home buyer or seller views a real estate agent. As they listen to a sales presentation, in many instances, they know they are being sold. This property is fantastic. This property is a perfect fit for this couple and their family. The schools are great. The neighborhood is fantastic. Sure, as a broker or agent, you want to instill enthusiasm for a property. You want to get the seller pumped up. Certainly, nobody wants to buy anything from a Debbie Downer-type person. But what if you also brought up some possible negatives about a home in question? With real estate data from national providers such as Home Junction, Inc., brokers and agents have access to an incredible range of information about a particular property and a particular neighborhood. Some of that information might be positive. Some might be negative. It’s data. Data doesn’t lie. For example, there’s a couple who are interested in buying property in the Sunshine Groves neighborhood. When the agent pulls up a comprehensive data set of information about that neighborhood, they learn several things. That data set shows the trends in home sales, trends in prices, schools info, demographics, crime statistics, weather, etc. When using the Home Value Estimator Tool also available from Home Junction, an agent can present a snapshot of where that property lies in relation to the general marketplace. 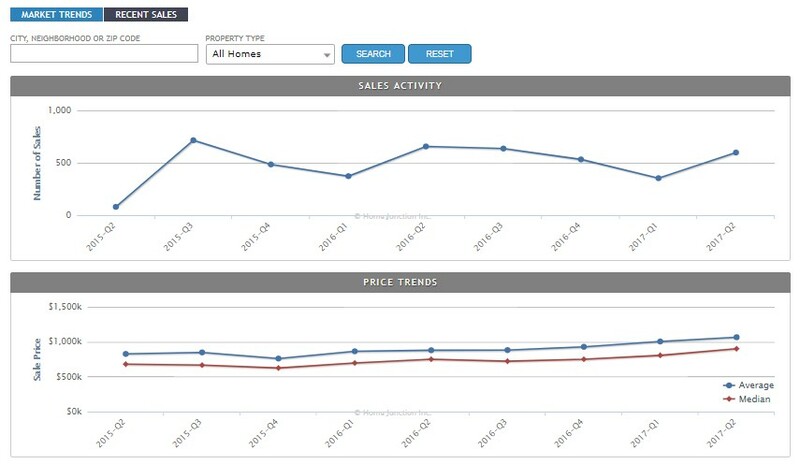 The home value tool shows the percentile ranking how a home might be positioned compared to other homes in terms of Size, Price, Price Per Sq. Foot and Age. The couple is very interested in a home located at 123 Maple Lane. Perhaps the home is priced a little bit more than they budgeted. But it’s the right size with the right number of bedrooms with exceptional schools located nearby. However, they do own a home now and have expressed a reluctance to move. Taking on a bigger mortgage is a big decision for them. The agent walks them through the real estate data they pulled from Home Junction’s massive national database. The home sales chart shows home sales are increasing in that neighborhood. The schools in that area have exceptional ratings and a nice ratio of teachers to students. The two buyers have college degrees and the demographics show there are a large number of residents in that neighborhood with bachelor degrees or higher. All the data looks very appealing. However, when the agent shows the results from the home value estimator tool, the couple notices that the size of the home is in the small percentile compared to other homes in the area. They decide to make the move, put their home up for sale and buy the new home anyway. One possible reason why? Trust. By showing the home buyers the complete picture created by the real estate data, the agent was able to elevate his or her level of trustworthiness with the couple. First of all, the buyers were able to review an incredible array of information about that property, not just a sales sheet from an open house and a few subjective comments from an agent. This is hard data. True facts. Not conjecture or vague references. Secondly, they could see the good and the bad. The agent did not try to sugarcoat ALL the information about the property. By showing the buyers that the size comparison information, in the mind of the buyers, the agent became someone they could trust. That agent was transformed from just a salesperson in their mind initially, to a consultant. An adviser. Someone who could give the buyers real and complete information to help them make one of the most difficult decisions they will ever make in their lives. It’s the waiter with the recommendations all over again. When reaching that tipping point of trust with that agent, consumers will want to do more with that agent . Perhaps they will list their home with that person. Or, they will call them again in five years when they are considering another move. You can also be sure they will refer that agent to their friends and family. In this day and age of hucksters and scams, people have their guard up. They are skeptical. Savvy businesspeople will not focus on the sale, but on the relationship. On providing solutions and answers. It’s amazing how far a person can go with just a little bit of honesty (and a comprehensive real estate dataset). For the waiter, the payoff could be an order of cheesecake and a big tip. For a broker or agent, the reward could be the sale of a $450,000 home with three referrals. That’s the power of trust. That’s something that can easily be achieved with a full menu of real estate data in the hands of a trustworthy broker or agent.